Patrick Maley reviews Antoinette Nwandu’s urgent call to action against police killings of black men. Subtlety has little place in times of crisis. Although Antoinette Nwandu’s Pass Over is rife with elegant use of subtle devices like allegory, metaphor, and allusion, it is, at bottom, bold agitprop, not shy about making overt claims and accusations. Pass Over insists that great danger is clear and present and that if this crisis can be alleviated at all, a response must happen right now, preferably before the audience makes their way to the exits. Pass Over treats the violent reality of police killing black men as a dangerous epidemic rather than a series of stories in the news cycle. 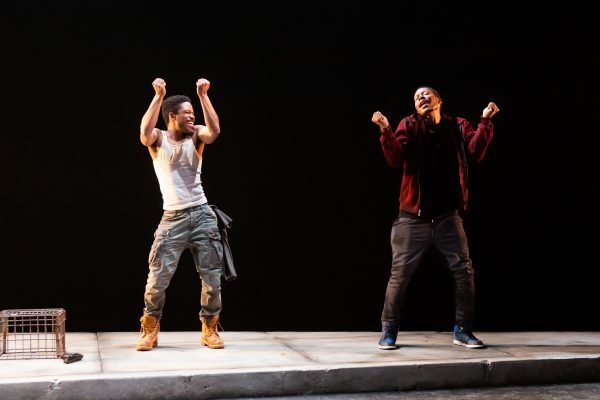 Moses (Jon Michael Hill) and Kitch (Namir Smallwood) are young, homeless black men who spend their days and nights on an indiscriminate sidewalk next to a lamppost in a setting that Nwandu calls “A ghetto street… But also a plantation. But also Egypt, a city built by slaves.” If one sleeps, the other keeps watch. Frequently, both throw their hands in the air, frozen in terror by police lights. Like Moses and the enslaved Hebrews, these two are determined to rise out of their oppression and pass over into a promised land, but like Waiting for Godot’s Vladimir and Estragon, their existence is mostly stagnation. No God comes to their rescue, as Beckettian stasis overwhelms biblical salvation. Moses and Kitch’s environment ultimately proves to be imperfectly self-contained, as they receive occasional visits from an aggressive white cop, and perhaps more worrisomely from an overnice white man (both played by Gabriel Ebert) who wanders, lost, to their streetlamp. Nwandu collapses any idea of security in the space and relationships that constitute Moses and Kitch’s world. Director Danya Taymor captures that mood of justified paranoia effectively from the start, having Smallwood’s Kitch patrol the stage with a large rock in hand as patrons make their way to their seats, eying up audience members and keeping a close eye on the entrance doors. Here and at the play’s conclusion, Taymor and Nwandu seem particularly interested in addressing the white, bourgeois, lefty, theater-going type terribly concerned by news stories of police killings but mostly silent in terms of resistance or redress. Pass Over conscripts these people into the play, casting them as Egyptians to the Hebrews, overseers to slaves, slumlords to the impoverished. The move is not subtle, but Pass Over willingly eschews nuance. Nwandu’s language is lyrical, and delivered with great skill by Smallwood and Hill, and the play’s social and textual interplay impressively and efficiently summons deep layers of history to the stage without being pedantic. But in the end the play is an urgent call to action. It is fair to call Pass Over heavy-handed, but Nwandu suggests that crisis is no time for a delicate hand. Pass Over runs to July 15, 2018. More production info can be found here.